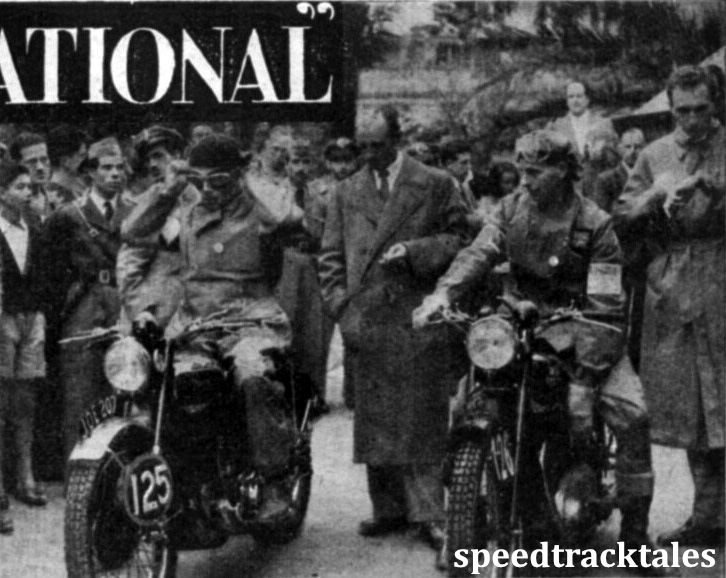 This picture taken at Llandrindod Wells was puzzling all until we found the assembly of riders was not actually the 1949 ISDT Team but those selected in a 2 days Trial in Petrol shortage days to select the teams to go to the Italy ISDT in 1948. Fred Rist is second from left, can visitors identify others to us?. The 1948 Team Selection account in www.silverdragons.co.uk is as follows in italics with thanks to those involved & John Barnes who designed plus put that site together:- That same 1948 Eppynt TT Race day, over in Llandrindod Wells, despite haranguing criticism, ‘Government Officials’ had reduced a permitted level for Britain’s ISDT Team selection trial. They were being described as being so lacking in imagination they would jeopardise success of a National Team in an International contest by forcing a stern 2 day Test to reduce an allowed fuel quantity by more than half!. Speed tests were to be held on Eppynt course Tuesday, this time with ‘crash hats’, and a forecasted only a whiff of petrol, though strangely, nobody is actually reported as having run dry. The ‘black market’ saw us right!! was the turn of phrase which followed. This Mid Wales location had been selected directly since many sections still remained of the 1938 I.S.D.T. which had been held there, course plotter! 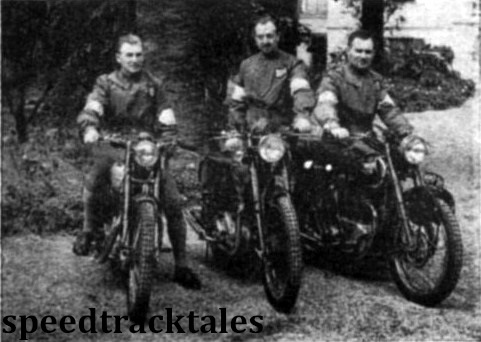 – Harry P. Baughan, the very man that built his own Trials sidecar outfit, with a Stephens motor and called The Stag, Dave James recalls had been instructed to plan a course to find weaknesses in men or machines, now bearing things like improved suspension layouts, WD type air cleaners. 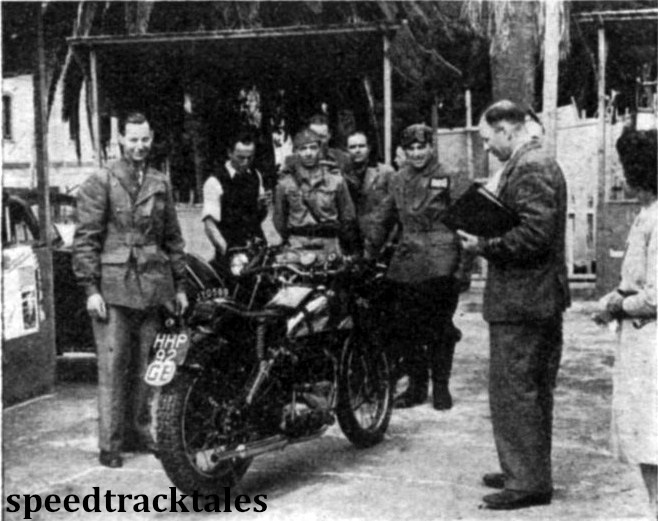 Jack Stocker’s rigid frame Royal Enfield ‘J’ model type now seems to have been a link with the past. 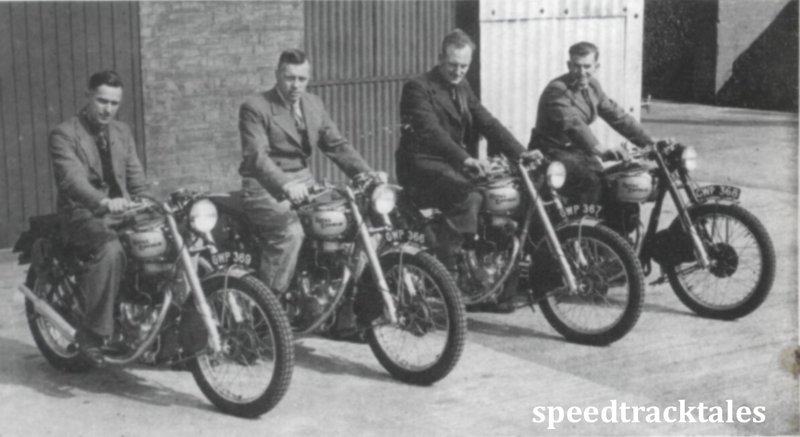 Neat Triumphs, plunger Ariels, Alloy engined BSA, Pre-featherbed framed OHC Nortons, Batteries to help lighting, KLG plugs expert Rex Mundy was present plus Dunlop tyres man Dickie Davies. Even a Manufacturer’s Union Director, Major H.R. Watling was prominent, ACU’s Harry Cornwell too. Private entries included Miss Olga Kevelos, 347 AJS, Australian D. B. Williams on a 498 AJS. Plus a 3 man B.A.O.R. 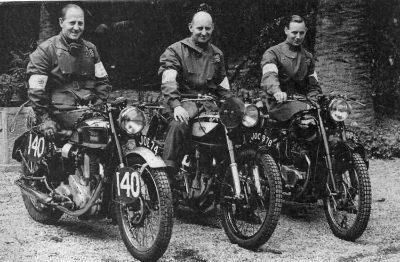 team all on 498 Matchless, Sgts. A. Hanson & J.W. Ward, plus Pte. J. Hall. Thus the above had passed for 1948! 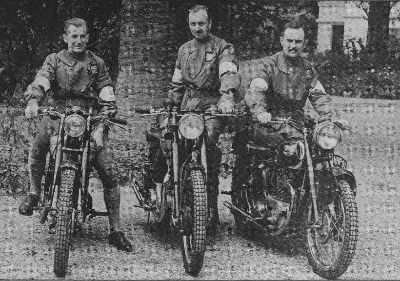 British 1948 ISDT Trophy winning team in San Remo was A. Jefferies, B. M. H. Viney, Jack Williams C. N. Rogers, Vic Brittain, Silver Vase taken there by P.H. Alves, C. M. Ray, W. J. Stocker some must be in this pic! Edward Damadian kept records of that 1948 event as a Diarist, in the 1920’s he had been a successful competitor himself at Merano in 1932. 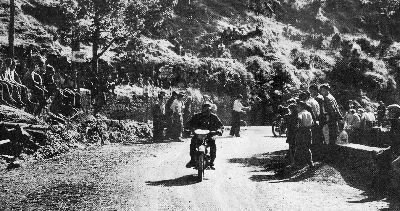 Fuel (albeit at 76 octane, a far lower grade than UK Premium) plus food rationed in UK was recorded as plentiful as they prepared for a 30 mph speed average on 1300 miles of narrow rough Alpine roads. No observed Sections!, however Gold Medals could be frittered away for only one mark lost for lateness. 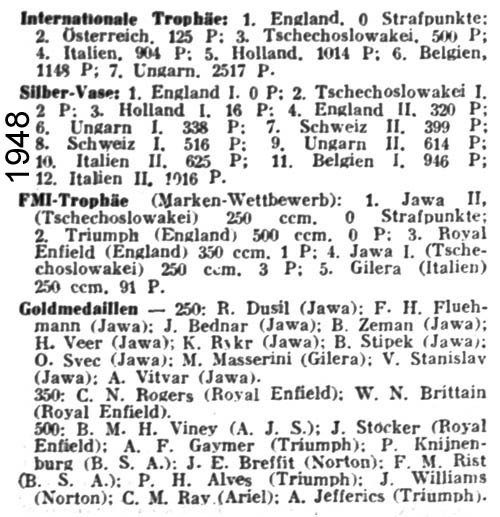 174 entrants in 1948 saw only 26 Golds awarded. Earlier Douglas Team rider Cliff King accompanied Edward. 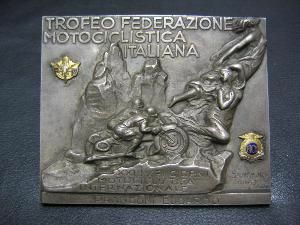 That pair travelled to Northern Italy San Remo over Napoleon’s French Alps crossing route which Cliff King had travelled in ISDT 1925 event & on September 12 arrived at SAN REMO!. British Team members plus entourage had all been booked into a single Hotel, whilst Private Entrants were booked in an adjoining one. Conference?, last minutes advice took place after the 07.00 am Tuesday weighing in. 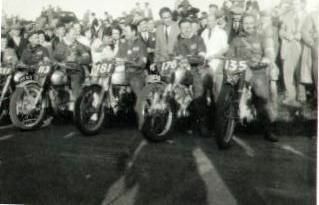 Start line was 3 miles from their Hotels & it soon dawned on riders their big machines would struggle against 2 strokes & lower average speed merchants on 250 machines. Czechs were rubbing their hands!. Trophy Team prior to start, the ensuing struggle went on day after day until Saturday, none of Britain’s Top Teams had dropped a mark. Next, the Sunday morning difficult 80 miles speed test course. Prize awards were distributed at the lavish San Remo Casino. Entire British Team plus officials at San Remo. 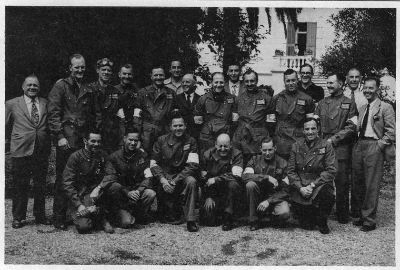 L to R Arthur Prince, Tom Ellis, Allan Jefferies, Jack Stocker, Hugh Viney, Len Heath, Doc Galloway, Fred Rist, Joe Gandilio, Bob Ray, Vic Brittain, Peter Chamberlain, Jim Alves, Edward Damadian, Cliff King (kneeling) Ted Breffitt, Charlie Rogers, Jack Williams, Jack Blackwell, Bert Gaymer, George Eighteen. 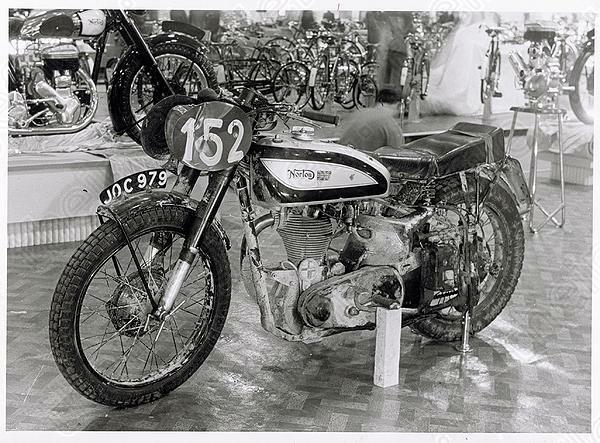 Photo of #152 Blackwell’s Norton [JOC 979] used in the 1948 ISDT, shown in 1949. Harry Baughan gets in a good position to observe. (looks a little like Peter Cooke there!) 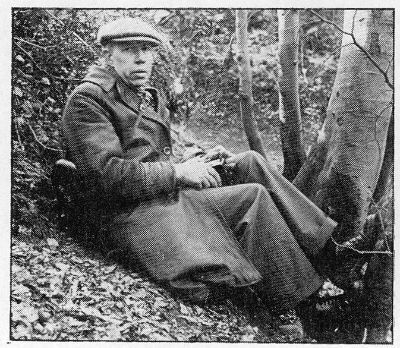 He actually was the ISDT Committee Chairman & virtually kept record of the British Teams Expedition since leaving Dover!!. The Teams had left Dover on the SS Dinnard on September 6th to all be discharged at Bologne by 2.30 pm then drove the 200 miles to the venue, spending nights at Fontainbleu. Teams returned September 23 via the same route. Teams paused on Tuesday Sept 7th at the costly Trois Dolphin Hotel at Grenoble. 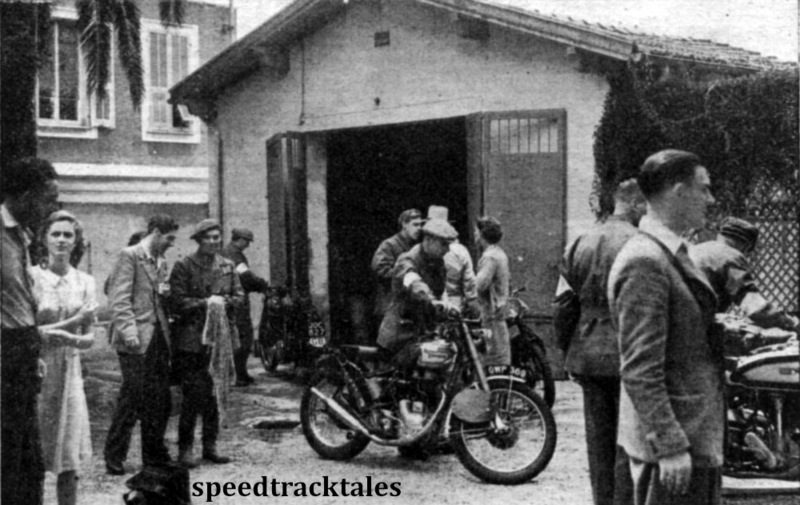 Wednesday Sept 8th across the Alps with lunch at Serres which all declared their best lunch of the trip then through Custons into Italy arriving at San Remo 8.00 pm after 865 miles from Bologne they settled into Grand Hotel des Anglais. The first arrivals from Britain, Thursday saw contact being made with Mirandi & Beau Sejour hotels to locate all team members & reserves & officials. Vic Brittain, Charlie Rogers, Jack Stocker & Tom Ellis had already been in San Remo a few Days, checking the course out and reporting it a tough one. By Friday, Sept 10 Customs Objections at the Railway Station had delayed Hugh Viney & Jack Blackwell’s machines & only Bob Ray’s arrival was awaited by the Teams. Midday test runs were sent on 11 Sept & George Eighteen declined to be on it since he had in his view already carried out plenty. The official interpreter reports in ill ‘with a sick note’ & Joe Gandilio stepped into the breach. Sunday 12 Sept. Bob Ray still a non arrival, teams proceed to speed test & carry out 10 laps, Dickie Davis of Dunlop places all tyres with puncture sealant. Monday Sept 13th Machines prepared for weigh in Bob Ray arrives 1.30 pm & went on a lap or two on the Speed course. Evening saw a press conference. ISDT Day 1 – all OK other than Jack Blackwell who lost 3 marks & the Czechs were all clear. ISDT Day 2 – All start OK before lunch Jimmy Simpson appeared with George Eighteen who had retired after a crash. also carrying Vic Brittain’s rear mudguard with broken stays reg & GB plates plus lamp assembly. repair & refit after welding & brazing rapidly judiciously arranged. ISDT Day 3 – Vic’s mudguard fixed aboard all away OK, Jack Williams reported to have bent front wheel & forks as result of running into Jim Alves rear end at a time check but he can keep going. ISDT Day 4 – Charlie Rogers rear mudguard stays cracked & bracket needed to support, Blackwell retires with engine trouble, Jack Stocker’s fork broken across head stem lug, Viney, Alves, Rist, Bert Gaymer, & Allan Jefferies going well caring for their machines, Brittain comes in on a flat tyre which gets done without time loss. Czech team loses Pastika! so a clear 18 points lead for Britain emerges over Austria & Harry Baughan warns Teams to take care!. ISDT Day 5 – Tyres get changed, Rogers reported to have had a serious crash bu he and machine do finish even if poorly, Doctor arranged plus car to hotel. 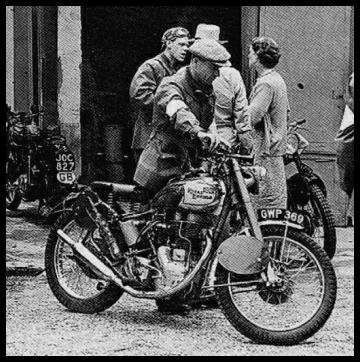 Allan Jefferies sends message to Harry via Arthur Bourne to have large hammer & chisel ready when he arrives in, ‘message reached Harry 2 x mins prior to Allan’s arrival & cussing of all followed whilst the bits were somehow obtained & front fork nuts removed, oil added to undamped teles. 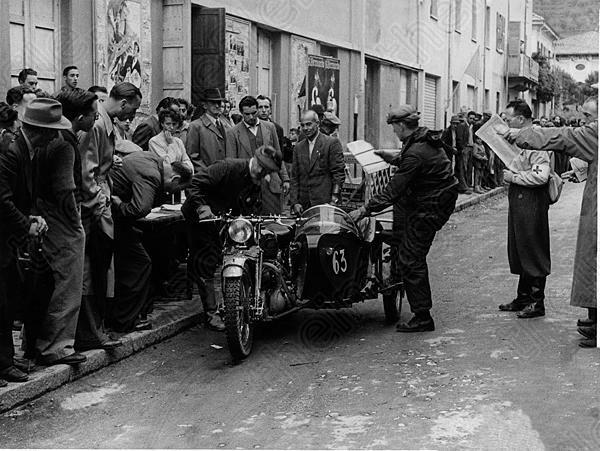 instructions go out, not to race the Czechs who have an unpenalised Club Team in the Hunt along with UK’s Sunbeam A & Sunbeam B.
ISDT Day 6 – Jim Alves finds starting difficult with a slipping clutch! but gets away OK, all continues well Jack Stocker keeps going with well wrecked forks with a nearside leg BROKEN., a clamp is fashioned to try to hold this by Jack Stocker, Bert Perrigo and Harry Baughan using a similar bike they found in San Remo as a template!, Jack had to officially start then fit the clamp, Jack had 2 sets of leathers on throughout the speed test in case of a crash resulting!!! he kept going to the average speed required too. Trophy, Vase, and Club Team Contests all brought Champagne & congratulations & a Party became arranged at the Casino. Tuesday Sept 21 all returned elated plus ‘broke’ to a UK where ration Books ruled. 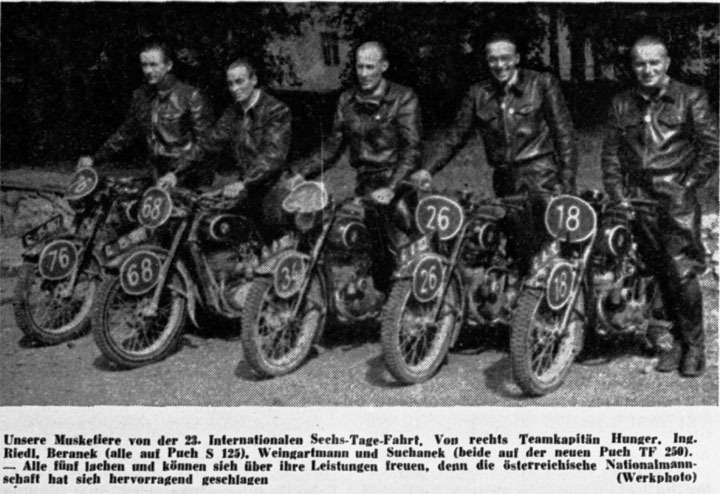 As of yet the FIM have been unable to locate a copy of the official results however thanks to the heard work of our regular Europe correspondant STB we have been provided with the results as they appeared in the report on the event in the German Motorrad Magazine. 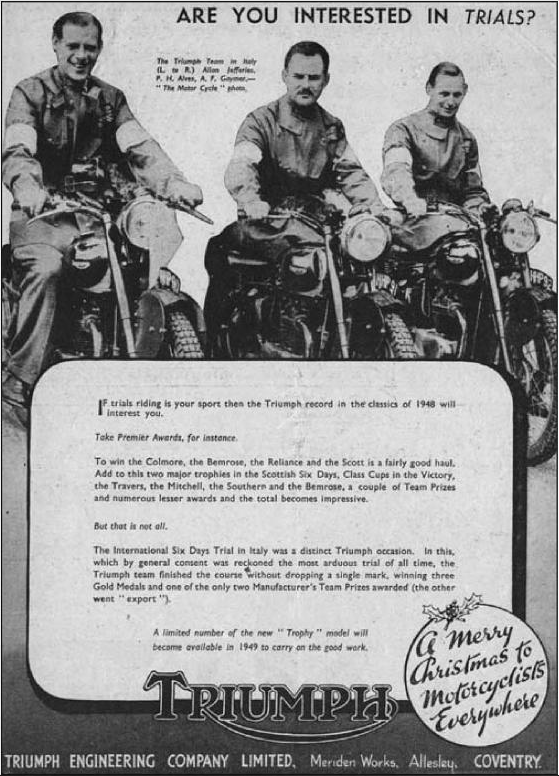 Triumph were again buoyant at the success of Alan Jeffries , P H Alves and A F Gaymer on modified speed twins, as this advert shows, featuring a photo taken from Motor Cycle and listing other successes in the Bemrose, Colmore, Reliance, Mitchell, Southern, Scott and Scottish Six Days Trials. 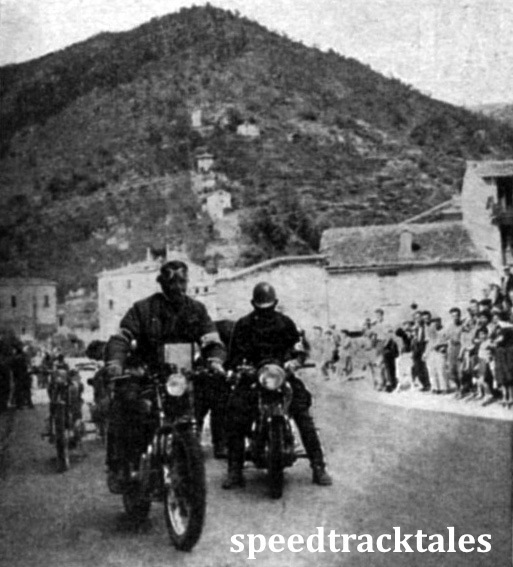 I have an interesting photograph, copyright “Motor Cycling”, which is the original from which the speed test picture is based, as shown in the Royal Enfield pamphlet. The photograph clearly shows the scary misalignment of the left fork leg. When the bottom yoke broke Jack used a clutch cable, twisting it tightly around the forks with a tyre lever, to pull the leg back to the yoke. Then, overnight, a clamp was fashioned with chain in an attempt to pull it in more tightly. The expression etched in his face and the extra leather jacket he is wearing clearly reflect the risks in attempting to maintain the required average speed! Pit signals were given to Jack during the test, varying between gentle waving to go faster to frantic gesticulations to slow down, at any unnecessary excess! 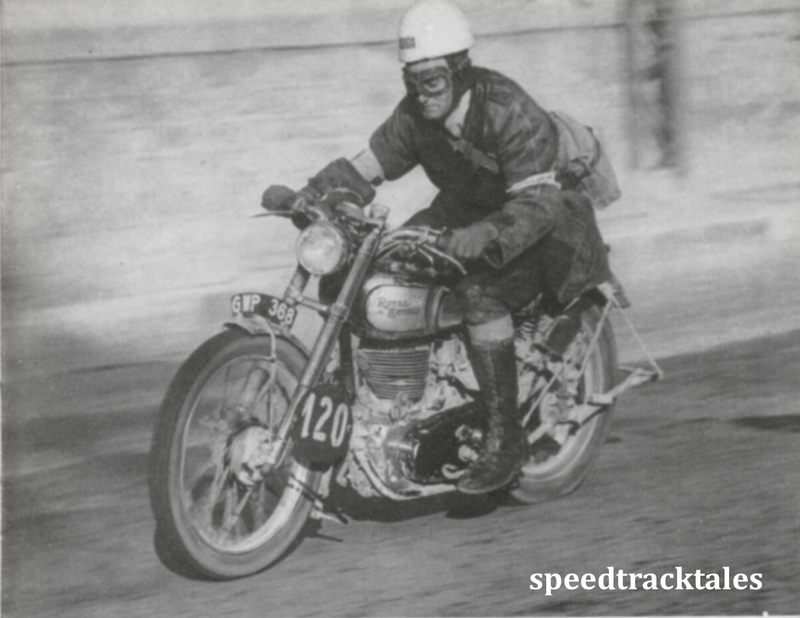 Great article and photos, I have 1948 bullet a G2 (frame 11627) which I believe is the only surviving example of the original 10 spring framed works bikes the factory produced ( don’t think mine was one of the 6 that was shipped to ISDT ). Still it’s got the alloy rear brake hub and trials box etc and is a fun ride. If you send us a photo we’ll publish it, I’m sure there are many readers who would love to see it.